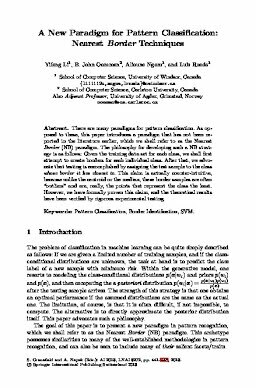 There are many paradigms for pattern classification. As opposed to these, this paper introduces a paradigm that has not been reported in the literature earlier, which we shall refer to as the Nearest Border (NB) paradigm. The philosophy for developing such a NB strategy is as follows: Given the training data set for each class, we shall first attempt to create borders for each individual class. After that, we advocate that testing is accomplished by assigning the test sample to the class whose border it lies closest to. This claim is actually counter-intuitive, because unlike the centroid or the median, these border samples are often "outliers" and are, really, the points that represent the class the least. However, we have formally proven this claim, and the theoretical results have been verified by rigorous experimental testing.